A Polished Palate Turns 2!! I can't believe I almost missed posting this! Maybe it's because I've got my wedding anniversary and my birthday on my mind, both of which are quickly approaching. 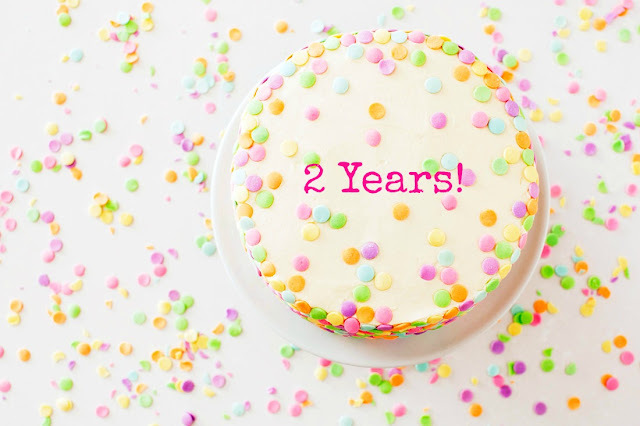 But today I'm celebrating two years of blogging! It has been such a fun journey, meeting new people along the way, learning new things from others and using this platform as a creative outlet. Although I may not get around to writing as much as I would like to, I'm still proud of myself for not giving up. Last year I celebrated with a post reflecting on the things I've learned through my blogging journey. I didn't create a new list this year because I still stand by the things I previously mentioned. I did want to share a look back on some of my favorite posts (found at the bottom of this post). I did want to add a special thank you to those that have supported me along the way, especially my husband. Also, a thank you to those that I have partnered that have allowed me to experience and share some great products. 1. You don't have to post everyday. When I first began my blog, I felt the need to post content every single day. I began to realize that it's more about quality over quantity. It's okay if I don't have a post everyday, and quite honestly, it's normal. Life is busy and I want my blog to remain enjoyable, and for that reason I decided to stop putting so much pressure on myself to create content five days a week. 2. Writer's block can and will happen. There are times when I've found myself staring at my computer screen, searching for the right words to express my thoughts. I've actually spent hours scouring the internet in hopes of sparking an idea for an interesting topic to discuss. I've realized that sometimes I just need to step away and clear my mind. On multiple occasions, I've come up with great post ideas while laying in bed at night or while I'm in the shower. It's when I have a clear mind and I'm not focusing so hard, that I come up with some of my favorite posts. 3. Supporting other bloggers through commenting is an appreciated gesture. Patience, it's definitely not my middle name. I try very hard to remind myself that "good things come to those who wait." After just a few months of blogging, several people would ask me if I had any companies reaching our for collaborations yet. I would get frustrated when my answer was no, and often had to remind myself that it doesn't happen overnight. Blogging takes time and effort. Companies want to see that your are putting your best content out there and that you aren't going to disappear overnight. It took me a while to realize this, but I finally did. I by no means have a ton of collaboration experience, however I've recently started receiving a few inquiries here and there. It takes time for people to realize you exist and it took time for me to understand that. Patience is key. 5. You will make some great friends along the way. From attending blogger events to getting to know someone via the web, blogging has opened a door to new friendships for me. I've made friends with people that I haven't ever actually met in person. I've also met a lot of new friends through blogger socials and local events. For me, blogging has filled a void. From being on the cheerleading squad in high school, joining a sorority in college to being a part of other various groups, I've always been a social person. I realized that I needed some sort of social activity in my life after moving to Charleston and starting my job, which is one reason I decided to start blogging. I'm so thankful for the new friends I've made, and I look forward to meeting more! Congratulation on two years! This is a huge accomplishment! Love your tips :) I couldn't agree with them more! Yay, happy 2 years! I relate to every single thing you wrote above and started my blog for the exact same social-craving reasons (cheered in high school, sorority in college, etc.). Happy posting!